Tatyana Kleyn is associate professor and director of the Bilingual Education and TESOL Programs and faculty advisor to the Dream Team at The City College of New York. She has an Ed.D. in international educational development at Teachers College, Columbia University. 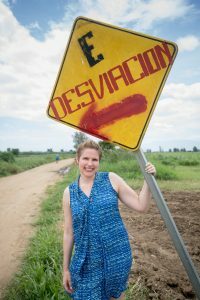 Her dissertation – focused on the intersections of bilingual and multicultural education in Spanish, Haitian, Chinese, and Russian bilingual classrooms – earned an Outstanding Dissertation Award from the National Association for Bilingual Education (NABE). Tatyana received the early career award for the Bilingual Research SIG for the American Educational Research Association. For 2014-15 she served as president of the New York State Association for Bilingual Education and a Fulbright Scholar in Oaxaca, Mexico. Tatyana is co-PI for the Multilingual Learner Project, which works in collaboration with New Visions to prepare high school content teachers to better teach their bilingual students. She was a research associate and acting co-PI for the CUNY New York State Initiative on Emergent Bilinguals (CUNY-NYSIEB), which supports educators across NY in developing using students bilingualism as a resource and creating school-wide multilingual ecologies. Tatyana is author of “Immigration: The Ultimate Teen Guide,” co-author of “Teaching in Two Languages: A Guide for K-12 Bilingual Educators” (with Reyes) and co-editor of “Translanguaging with Multilingual Learners: Learning from Classroom Moments” (with García). She is the director and co-producer of the Living Undocumented documentary series and “Una Vida, Dos Países [One Life, Two Countries]: Children and Youth (Back) in Mexico.” Tatyana has published about the educational of the Garífuna in Honduras and students labeled ‘Long-Term English Learners’ in NYC secondary schools. She was an elementary school teacher in San Pedro Sula, Honduras and Atlanta, Georgia.